Some audio features can be controlled using the switches on the steering wheel. Operation may differ depending on the type of audio system or navigation system. For details, refer to the manual provided with the audio system or navigation system. press and hold this switch to mute or pause the current operation to cancel the mute or pause, press and hold. 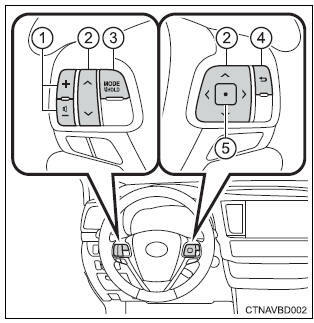 Exercise care when operating the audio switches on the steering wheel.